The issue of death with dignity could soon be up to voters in Maine. In Maine, the 2019 election could include a question of life and death. A citizens group has launched a petition drive to get a "death with dignity" law on the statewide ballot. If they gather more than 60,000 valid signatures, Maine voters could decide if terminally ill patients should have access to life-ending medication. "I really think this is a compassionate thing," said Cayla Miller. Her mother, Eva Thompson, died from cancer four months ago. Thompson had previously lobbied lawmakers to pass a death with dignity bill, and she wanted a less-painful way to die. "She knew what cancer would do at the end, and how painful that would be," said Miller. "She was scared of the pain, and scared of being helpless. She thought it was important that everyone have a choice." Miller was among the first to sign a petition for the referendum question Thursday. 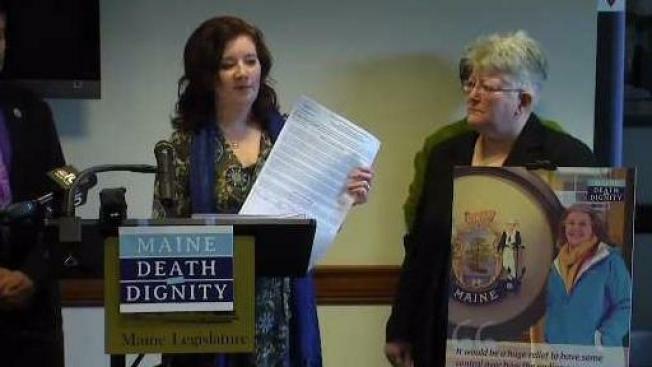 The Wiscasset-based group "Maine Death With Dignity" is organizing the petition drive. Maine lawmakers have attempted to pass similar death with dignity laws, but fell a few votes short. Sen. Geoff Gratwick said there were some ethical and religious objections to the bill, but felt confident Maine voters would endorse the idea. This latest proposal would require patients to submit multiple requests to doctors for life-ending medication. They can only receive it if they have been diagnosed as terminally ill, with less than six months left to live. Maine Death With Dignity Chair Valerie Lovelace said patients would have to go through a waiting period to get the medication, and they would receive counseling. There are several other "safe guards" in the bill, modeled after a similar law in Oregon. There are some objections in the hospice and palliative care community. Physician James Van Kirk, a palliative care doctor, said the state should be focused on increasing access to comfort care, especially in areas where there isn't any. "In our state, there are vast areas where no palliative or hospice care is available to the population," said Dr. Van Kirk. He worries passing a law to authorize physician-assisted suicide would give people in those rural communities only that option for end-of-life care.